A new term has become popular in Chinese political parlance over the last few years. This neologism—‘high-speed railway diplomacy’ (高铁外交)—is used to describe the mechanisms by which China’s burgeoning capacities in high-speed railway (HSR) construction are being used in China’s international relations. The speed at which China has mastered HSR technology is unparalleled. 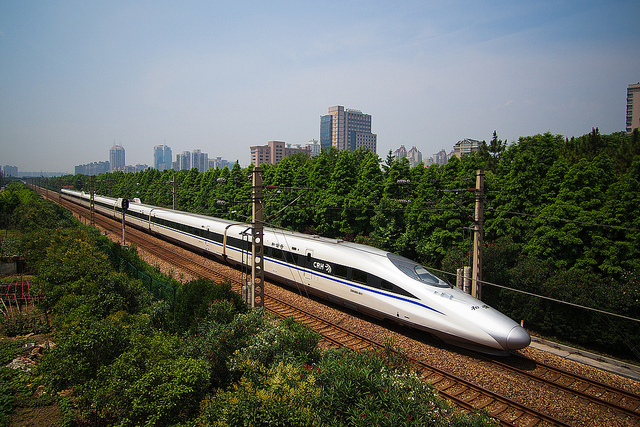 Beginning with the import of technologies only in 2003, China began operating the Beijing-Tianjin HSR by 2008. In that same year, it built a train capable of a speed of 350 kilometres per hour. Today the country boasts the greatest length of HSR track in the world (over 10,000 kilometres of rail capable of carrying trains at speeds in excess of 200 kilometres per hour). Further, China South Locomotive and Rolling Stock Corporation Limited (CSR) has achieved global records in terms of speed, with tests reaching 600 kilometers per hour. The scope of the system can be gleaned from the fact that in less than 2 years the HSR line linking Beijing and Shanghai recorded over 100 million passenger trips, while the Chinese government plans to invest over US$100 billion in railway construction this year. China’s new and relatively cheap expertise in this technology is being promoted as both an economic and diplomatic tool . Discussions on export of the technology are being held around the world and visiting dignitaries to the PRC are being urged to use Chinese technology for their future HSR. India, for instance, is actively seeking Chinese HSR technology , while during a meeting with Premier Li Keqiang in Beijing in mid-October, Australian Governor-General Quentin Bryce was urged to employ China’s HSR technology for Australia’s needs. But it’s the external connections of China’s system which are of prime interest to us here. A 1,700 kilometre high-speed track will connect Lanzhou to Urumqi in Xinjiang  (8 hours) from 2014, and this is intended for extension to Central Asia, while the Shanghai-Kunming route is slated to open in 2016. When completed, trains  will take but 8 hours to cover the more than 2,000 kilometres between these two cities. Longer-term plans  are afoot to drive an HSR route from Kunming into India and then through Pakistan to Teheran. It’s from the Kunming hub that the high-speed rail system will route into mainland Southeast Asia, and it’s in this region that China’s HSR will be a strategic game-changer. As part of Thailand’s massive plans to upgrade its transport infrastructure, China is offering support through provision of HSR technology. Of the four Thai routes planned, the main one will be the northeast line , from Bangkok to Nong Khai, which will continue through Laos to Kunming. This route is planned to be functional by 2020. While Thai Transport Minister Chatchart Sitthipun has said that  tenders will be called in 2014, his visits to Kunming, and the discussions on possible rice barter trade agreements  with the PRC to fund the project suggest that the eventual contractor will be from China. Chinese engineers are already conducting geological surveys along the routes. There’s also discussion about a branch line which will run from Bangkok to the Thai-funded Dawei Special Economic Zone (SEZ) in Myanmar on the coast of the Bay of Bengal. During his recent visit to Bangkok, PRC Premier Li Keqiang opened an exhibition promoting a high-speed railway system  that would link China, Thailand and Singapore, making Singapore-Kunming a 12-hour journey. Other HSR routes connecting Kunming and mainland Southeast Asia cities are also being planned. A connection between Kunming and the Laotian capital of Vientiane was the subject of a 2010 memorandum and, while feasibility plans are still being conducted, the plan remains ‘on track’ .) A high-speed line Kunming to Yangon  was also proposed in 2010 and discussions are apparently ongoing. HSR routes connecting Kunming to Vietnam and to Cambodia have also been mooted and are seen as part of a ‘Pan-Asian railway ’ project. A conventional railway  from Kunming to Mengzi is being extended to the Vietnamese border and will eventually connect to Hanoi, completely replacing the narrow-gauge railway service which was discontinued in 2003. This process of developing HSR across mainland Southeast Asia has only just begun but the long-term effects aren’t difficult to assess. As was foreshadowed  several years ago, connectivity between mainland Southeast Asia and southern China is growing much faster than intra-ASEAN connectivity, and the strategic geography of East Asia is thereby being changed forever. Driven by the high-speed rail networks, new roads and telecommunication facilities centring on Kunming, together with China’s burgeoning economic engagement—both trade and investment—with the Greater Mekong area, mainland Southeast Asia is in the process of disconnecting from maritime Southeast Asia. This will, almost inevitably, result in ASEAN dividing along this fault line. And when the people of the mainland countries soon find, through the convenience of HSR, that Kunming is their ‘closest neighbour’ but a few hours away, the Yunnan capital will gradually emerge as the hub of the Greater Mekong Region and will eventually become, in effect, the capital of mainland Southeast Asia. Geoff Wade is a visiting fellow at the College of Asia and the Pacific, Australian National University. Image courtesy of Flickr user 1010uk .